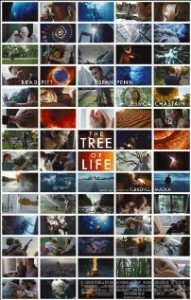 The Tree of Life is a staggeringly ambitious film that evokes not only the monumental beginnings of all existence in the universe, but also the tiny, specific details of ordinary lives; the result is a flawed but profound epic on the scale of 2001 with the emotional resonance that Kubrick’s more detached approach is often accused of lacking. It is also a film that deserves comparison to Darren Aronofsky’s extremely underrated masterpiece The Fountain (2006) in its themes of the interconnectedness of all time and space and the way in which we are all affected by forces beyond our control and understanding. It is the rare film whose flaws only make it more intriguing, since life itself is flawed and disconnected in much the same way. Above all, while comparisons can be made to other masterpieces in Malick’s own career as well as those mentioned above, this is a wonderfully unique and original film, with a style and voice unlike any I can recall. The two central ideas of the film are stated very early on, in voice-over, by Mrs. O’Brien (Jessica Chastain) as she recalls her childhood. She says that she was raised with the idea that “there are two ways through life: the way of Nature, and the way of Grace.” Nature, it was said by her father, wants to satisfy itself; it could be seen in these terms as an interpretation of Sigmund Freud’s idea of the id, the pleasure principle. Grace, on the other hand, seems to be something beyond even the super-ego, an almost Taoist way of living with acceptance of all things and faith in something greater than oneself; this way leaves no room for selfishness, and it is the source of high ideals like forgiveness and acceptance. Throughout the film, these ideas are continually explored in often unexpected ways. During the film’s amazing Big Bang sequence, for example, we see an injured dinosaur lying on the ground. A larger, presumably predatory dinosaur comes upon it and stamps on its with one foot, holding its head down. We expect it to kill and eat the small dinosaur, but instead, it considers for a moment before moving on, though not without a final push with its foot, as if it wants to make sure the first dinosaur is down. This can be interpreted in a number of different ways, such as the idea of life’s competition against other life, but within the context of the ideas of Nature and Grace, perhaps what Malick is showing us is just that. The predatory dinosaur’s Nature is to kill and eat others, but some element of Grace within it allows it to leave this one to its own fate. It is a scene that sets the tone for a deeply spiritual film with a distinctly Christian outlook, albeit one that never feels didactic or proselytizing; for the most part, it is far too subtle and evocative for that. 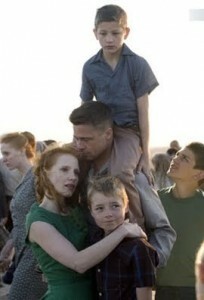 The human center of the film is Jack O’Brien (Hunter McCracken), the oldest of three brothers raised by Mrs. O’Brien and her husband, who is likewise only known as Mr. O’Brien (Brad Pitt). As an adult, Jack is played by Sean Penn, in what amounts to a cameo for the amount of screen time he has, and the film plays out as disconnected memories and reveries in his mind. Of course, this is not a conventional film, and all of its human actors are relegated to snapshots in time while Malick’s camera, guided by the excellent cinematographer Emmanuel Lubezki (Children of Men, The New World) swoops and dives through the farthest reaches of existence. The impact of the film’s Nature scenes cannot be overstated, but it is the human struggle for the abstract concept of Grace that provides its emotional impact, which is extraordinarily universal and timeless. Though the story takes place in the specific and clearly autobiographical time and place of 1950s-era Texas, so much of it feels like it was taken from my own childhood, and I feel certain nearly any viewer of the film will feel the same. Pitt’s performance as Mr. O’Brien is stellar, perfectly capturing the conflicts that constantly boil inside him and which he clearly passes on to young Jack, just as his father likely passed them on to him. One of the film’s most poignant moments is Jack’s voice-over: “Father, always you wrestle inside me. Always you will.” We get only glimpses of the adult Jack’s life, but it is clear from these that in may ways he has become his father, a man who builds things as men must, but who feels that he has failed and longs for something greater, something forever beyond his reach. Mrs. O’Brien is a less well-developed character, becoming more a representation of Grace (and, at times, Nature as well) than a flawed and conflicted human being, as Mr. O’Brien is, but I feel that this is because she is seen through the subjective lens of Jack’s own memories. We see more of Mr. O’Brien’s inner conflict because a large part of the story involves young Jack’s gradual disillusioning from the idea of his father as just, true and all-knowing; this, of course, is analogous to the realization that, if there is indeed a god, he or it is potentially fallible as well. It is an almost tragic loss of innocence for a young boy to lose this idea of his father as god, and The Tree of Life conveys this idea on a larger scale and with greater insight than any film I can remember. His mother, on the other hand, is remembered in a more subjective way, as an almost perfect angel of compassion and beauty; it is somewhat troubling that the film’s only major female character is so broadly drawn, but for better or worse, this is a look at a father-son relationship more than anything else. There is also Jack’s younger brother, R.L. (Laramie Eppler), who seems to have inherited more of Mr. O’Brien’s musical tendencies and less of his bent toward anger and violence, and in whose relationship with Jack we see a reflection of Jack’s own relationship with his father. This is another very universal idea I have never seen better conveyed in a film, the notion of an older brother’s responsibility to his younger counterpart and how directly his father’s treatment of him is carried on in this way. We see a good example of this in two more of the film’s most poignant scenes, first when Jack apologizes for intentionally shooting R.L.’s finger with a B.B. gun and later when Mr. O’Brien asks forgiveness for his own harsh treatment of young Jack. As mentioned before, this is a film with a decidedly Christian outlook, and it is possible that in some ways the father-son dynamic goes deeper (think “holy ghost”) than a single viewing reveals, in which case Mrs. O’Brien’s angelic appearance and rather slight involvement in the bulk of the drama could be explained by the possibility that she represents the Virgin Mary. I may be stretching here, but The Tree of Life is a film rich with such interpretive possibilities, and one that seems to demand multiple viewings. It is a demand I am certain I will not be able to resist for long. Thank you, John, for reading and responding. I still have yet to see it a second time (probably next week), but have already reevaluated some of my thoughts on it in light of rumors (which I cannot confirm or deny due to his intensely private nature) that Malick himself is an atheist. Certainly much of the film has Christian ideas and imagery init, but it also clearly pays homage to evolution theory, and perhaps the more overt Christian aspects (seen mostly in the last twenty minutes or so) are just further reflections from Jack’s own point of view, and not meant to be seen as factual from the filmmaker’s perspective in the way the dinosaur stuff seems to be. All in all,though, a brilliantly original and thought-provoking film, and yes, Pitt has arguably never been better (though I still think he is very underappreciated in Se7en). I’m surprised there isn’t more discussion here, so thanks again for your contribution.